Skydive Perris is proud to be known as LA’s premier skydiving center. As an industry leader with over 40 years’ experience we strive to deliver a 5-star skydiving experience at competitive prices that exceed the expectations of our guests. 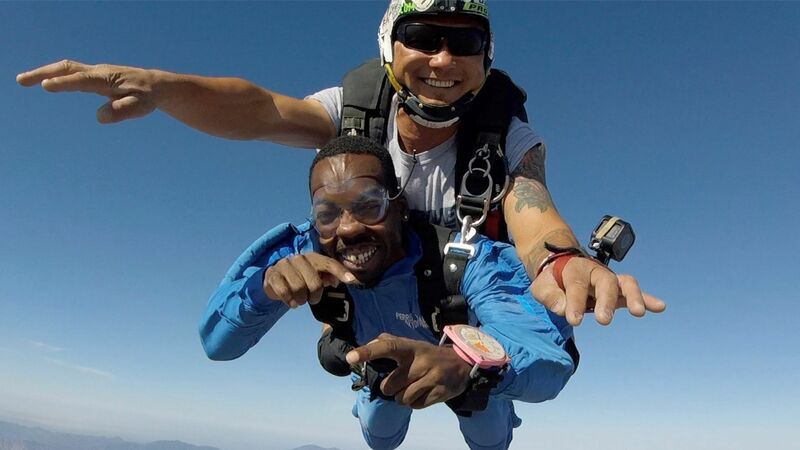 Our world-class facilities, superb safety record, and highly experienced instructors are some of the reasons why Skydive Perris is a name the Los Angeles skydiving community trusts. View skydive prices and packages below for tandem skydiving, group discounts, and other services. To make a reservation, book your jump online today or call +1 (800) SKYDIVE/951-657-1664 for more information. 20+ People - Free upgrade to Red Carpet Package and Free Social Media Package*, plus Group Organizer gets a free "Selfie" video package. The Adrenal-IN Experience is the ULTIMATE human flight experience! This discounted package starts with 2 flights in our Indoor Skydiving Simulator where you’ll float on a column of air allowing you to experience the sensation of freefall without being attached to an instructor. After completing your indoor skydiving experience you’ll then go tandem skydiving from 12,500 ft securely attached to an instructor. Participant must be at least 18 years of age and cannot weigh more than 240 lbs. This package is not available for online booking. Please call to book.